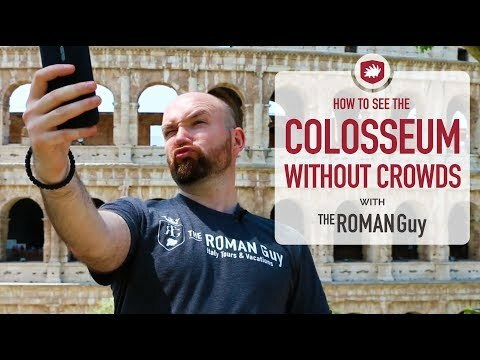 Watch as Bojan from The Roman Guy shows you how to skip the line at the Colosseum! The Roman Guy is a Rome based tour operator that and an expert in skipping lines in Rome (https://goo.gl/7Vmok3), Florence (https://goo.gl/TU4dwE) and Venice (https://goo.gl/qRbcUG). We also offer more comprehensive trip planning services! Visit our website at https://theromanguy.com for more info. Hi there. Bojan here from The Roman Guy. We're at the-- You know where we are. Today, we're going to show you how to see the Colosseum without crowds. The Colosseum behind me is one of the most visited monuments in all of Europe and the most visited landmark in Rome, averaging around 11,000 people a day (about 4 million a year). In the summer months, this number goes way higher and we're talking about 30,000 people each day trying to enter the Roman Colosseum. Now that's a lot of people - how are you going to avoid the crowds? We're here to help you out. There's three ways that you can see the Colosseum. 1. You can purchase your ticket after arriving to the Colosseum. This is the way that I strongly advise against because you're going to be standing down there with all of those people. Bear in mind, there are two different lines you're going to go through. One for the security check outside and one for the entrance tickets inside. If by any chance, this is absolutely the only way you can see the Colosseum, at least make sure that you bring a bottle of water and some snacks. In the summer, it can get really, really hot around there. You are allowed to bring small bags inside the Colosseum. 2. You should pre-book your entrance tickets on the Colosseum website in advance. In this case, you will only wait for the security check, which might take only a few minutes. After that, you will bypass the line of people waiting for the tickets, go directly to your reservation desk where you collect your tickets, and go inside. If you're not planning on joining a tour group, this is definitely the best way to do it. 3. Absolutely the best way to get the most out of your Colosseum experience is by joining a guided tour. Your professional Colosseum guide will share all the information you want. Plus, you will get skip the line Colosseum tickets and enter through a special group entrance. Your security line wait will be shorter as well. There are plenty of great tour companies around and even the Colosseum itself organizes tours. We recommend for the best experience, small group and behind-the-scenes options. Some of these include access to the restricted areas of the Colosseum including the Arena Floor and Underground. This means you will get to go underground into the areas where the wild animals used to be kept, on the reconstructed arena floor where the gladiators used to fight, and all the way up to the third level of the stands for an amazing view of the building and the area around it. Also remember, regardless of which option you choose, your Colosseum ticket gives you access to the Roman Forum and the Palatine Hill as well, so you can explore these areas too. Guys, these are your different options and different ways to get inside the Colosseum. Some with more crowds, some with less. The choice is completely yours.